My breed name is the same as the Mexican state of Chihuahua, where some people say we originated, but Chihuahuas as they are known today come from American stock. I'm a tiny little toy dog, but I can hold my own. A few of my relatives are a little bossy, but we're all intelligent and affectionate. I also have a reputation for being nervous, but if I am shaking, I'm usually just cold! I have a heating pad in my doggie bed and it keeps me very comfortable when I can't sit with my human friend. I am a terrific little watchdog, and I am the perfect size pet for those of you in small apartments. Some of my family members have short hair and some of them have longer hair, but aside from that, we are pretty much the same, personality-wise. My people parents have to help me watch my weight because I love snacks and they aren't too good for me. When fully grown, I am between 6 and 8 inches tall (15.2 to 20.3 centimeters) and I weigh between 3 and 6 pounds (1.4 to 2.7 kilograms). 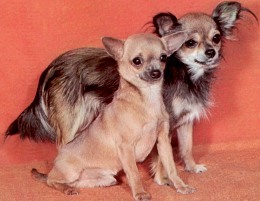 We have no Chihuahua Breeders listed at this time. Click here to place your Chihuahua Ad!